‘Immigrants, Refugees and Undocumented, Oh My!’ Grabbing a line from the Wizard of Oz we are living in a troubling time. Especially if you are a new immigrant or refugee and God help you if you’re undocumented. Using a time-tested technique, President Trump and minions play the anti-immigrant fear card to advance their political agenda. But this is nothing new. 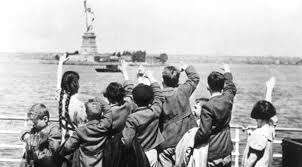 “New immigration” was a term from the late 1880s that came from the influx of Catholic and Jewish immigrants from Italy and Russia (areas that previously sent few immigrants). Nativists http://en.wikipedia.org/wiki/Nativism_(politics) feared the new arrivals lacked the political, social, and occupational skills needed to successfully assimilate into American culture. This raised the issue of whether the U.S. was still a “melting pot,” or if it had just become a “dumping ground,” and many old-stock Americans worried about negative effects on the economy, politics, and culture. 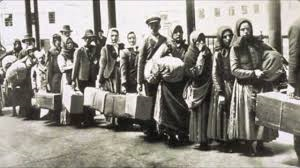 Restriction proceeded piecemeal over the course of the late 19th and early 20th centuries, but immediately after the end of World War I (1914–18) and into the early 1920s, Congress changed the nation’s basic policy about immigration. The National Origins Formula of 1921 (and its final form in 1924) not only restricted the number of immigrants who might enter the United States, but also assigned slots according to quotas based on national origins. It essentially gave preference to immigrants from Central, Northern and Western Europe, severely limiting the numbers from Russia and Southern Europe, Africa and declared all potential immigrants from Asia unworthy of entry into the United States. Underneath it all was a desire by those already here to keep America as they knew it. Essentially ‘white’. This specter of racism and fear of ‘the other’ has been a reoccurring theme in American history and is once again being played for all its worth by ‘nativist’ like President Trump, advisor Steve Bannon and Attorney General Jeff Sessions. The antidote of course is building relationships with immigrants, refugees and undocumented neighbors. In the past two weeks: An undocumented refugee from Congo (who fled a war) walked into my office to ask me to pray with him. He spoke of his fear of being deported, separating him from his wife and two-year old son (both of whom are US citizens). I spoke with a young couple from Brazil who are here on a temporary visa but want to stay and take care of her ailing father who is a US citizen. And, while my car was being serviced I spoke with a young legal immigrant from Egypt who pumped my gas. He told me of ongoing insults shouted by passing motorists, calling him a ‘f***ing towel head’ and ‘go back where you belong’. Such are the stories of immigrants and refugees that are our neighbors. ‘Nativists’ would have us believe that they are to be feared, that they are not like ‘us’. The problem however, is that I’ve gotten to know their names. Listened to their stories. Discovered that they want the same things you and I want. Safety and opportunity. Their family to be healthy and happy. Despite prejudice and hateful rhetoric immigrants and refugees still see the United States as a refuge a place to make dreams come true. They see what is best in us as a nation…even when we forget. What is needed is meaningful immigration reform. Something that Congress has resisted since last initiated by Ronald Reagan.